The photo above shows Vickers Viscount G-AMAV, race number 23, at a damp Essendon during a refuelling stop-over on the way home after the October 1953 London to Christchurch Air Race. 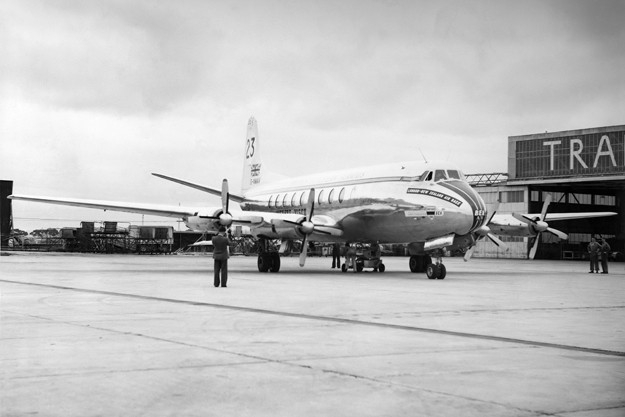 The winner of the transport handicap section of the race was the KLM DC-6A shown below, however the Viscount gained second place. It also set a Federation Aeronautique International (FAI) Class C1/1 speed record from London to Melbourne of 293.6 mph, covered in 35 hrs 47 min and halving the 71 hr winning time set by De Havilland Comet racer G-ACSS in the 1934 MacRobertson air race. This aircraft was the third prototype Viscount, a V.700 (c/n 739099, later changed to 3). 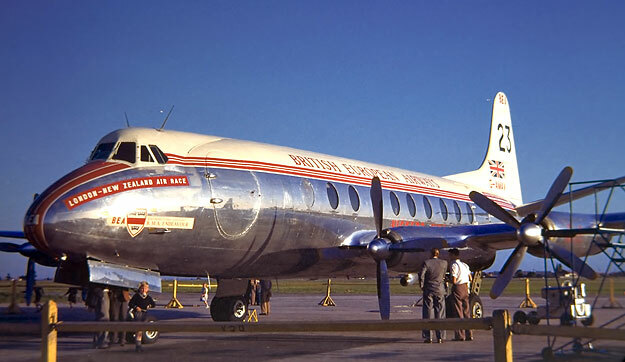 Since the Viscount was a joint venture between Vickers and British European Airways (BEA), it was loaned to BEA for the air race. The aircraft was painted in full BEA livery with race number 23 on the fin and a banner on the nose proclaiming "London-New Zealand Air Race". The aircraft was given the name RMA Endeavour, after Captain Cook's ship. Below: G-AMAV outside the TAA hangar at Essendon. G-AMAV was flown by a BEA crew under Captain W. Baillie and managed by Peter (later Sir Peter) Masefield. During the race, the aircraft operated at weights of up to 65,000 lb, some 17,000 lb heavier than its design maximum. The 12,365 miles of the air race was completed in 40 hrs 41 min flying time at an average speed of 290 mph. This included a non-stop 10 hr 16 minute flight from Cocos Is (in the Indian Ocean) to Melbourne/Essendon. No doubt this performance went a long way to confirm the wisdom of TAA's order for Viscounts, the first of which was delivered the following year. Below: G-AMAV at Essendon after the sun came out! Left: The crew of KLM's entry in the 1953 Air Race, DC-6A PH-TGA Dr Ir M.H. Damme. L-R: Third Officer J Noomen, Capt. H A A Kooper, First Officer J F Griffith, Second Officer P J Aarts. This aircraft, carrying a load of passengers and mail, won the Handicap Section with a time of 37 hrs 30 min.